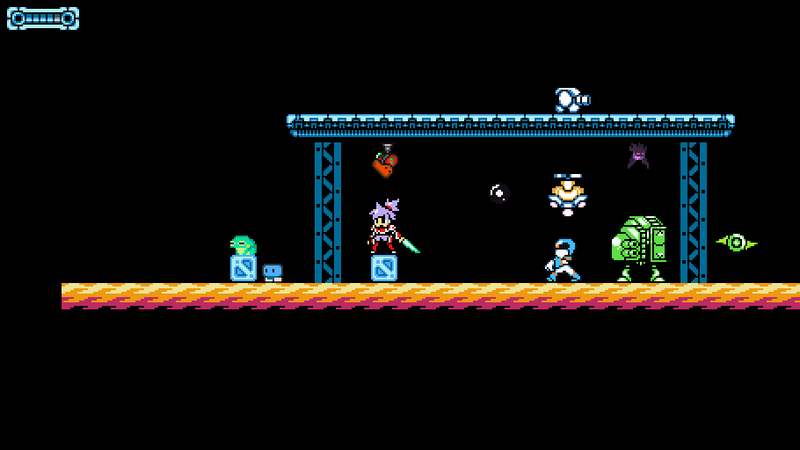 So far, eight enemies have been programmed into the game, with more planned for the future. The screenshot bellow contains all of the current enemies. Frog: The simple enemy that hops towards the player, if they get inside of its range. Platty: This enemy walks back and forth until it hits a wall. The main use for this enemy is not be an obstacle, but to be a platform for the player to be able to use. Saw Shooter: If you walk into its line of sight, a fast, menacing saw will be shot directly towards you. Bomber Ron: An enemy that launches bombs at the player from a safe distance. They explode on impact, after a certain time expires, or if slashed. Tri Flyer: This enemy hovers above the player and shoots down a volley of projectiles. M.O.S.S: This enemy shoots blades that travel in a sine-shaped pattern. They explode on impact, when hitting a wall, or when slashed. Bat: Another simple enemy that follows the player (even through walls) if the player gets too close. O.F.U: This enemy patrols an area and shoots projectiles to wall out the player.